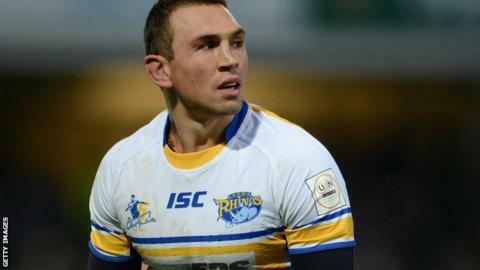 Leeds Rhinos captain Kevin Sinfield says the team "need to be better" this season. The Rhinos won the World Club Challenge,lost the Challenge Cup final to Warrington and beat the same opposition in the Grand Final in 2012. It was also a great year individually for Sinfield who was handed the England captaincy and won the 2012 Golden Boot. But he told BBC Radio Leeds: "I think that we need to be better and I hope that we can be." He continued: "It will be very competitive this year and we will have to make sure we are good every week. "We've spoke about some of the areas that we'd like to improve but I don't think you can pick out one area and say 'it was that particular thing'. I think it was across the board we just had some bad days. "It is difficult when you are playing the number of games we played last year but that isn't an excuse, we just have to find ways of being better. "It is important for us not to just be the hunted, we need to be the hunter too. We have to front up to these challenges." The Rhinos won the Grand Final despite finishing fifth in the regular season for the second successive campaign. They start their title defence on Friday with a home match against Hull FC who are now captained by former Rhino Gareth Ellis. "I don't think it gets much tougher but then if you look at all the teams then I don't think we could have had an easy start," he continued. "They've recruited really well and that shows the kind of impact they are looking to make. "Gareth is a great lad and a fantastic player, he is one of the best I have ever played alongside or against."